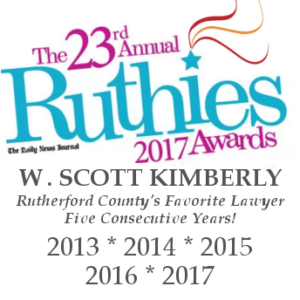 To support our office, you can go to the ballot for Favorite Attorney and vote for W. Scott Kimberly. You will have to scroll all the way to the bottom to find me, but it’s worth the wait! Remember, every registered user can vote once per day, so feel free to vote early and vote often! Who Gets the Engagement Ring When the Wedding is Called Off? Engagements and weddings are part of life. However, some engagements do not result in weddings. When two people are engaged, but the engagement is canceled, those two people often need to determine who is entitled to keep the engagement ring, if any such ring was given. I have written extensively on this issue over the past few months. First, I published a Legal Guide on Avvo, “Who Keeps the Engagement Ring in Tennessee?” which addresses Tennessee laws surrounding ownership of the engagement ring when a wedding is called off. Second, I published an article on Primer Magazine, part of the Legally Speaking series, “Legally Speaking: Who Gets the Engagement Ring if the Wedding is Called Off?” which surveys the various approaches that courts use to decide ownership of an engagement ring when the wedding is called off. Conditional Gift – An engagement ring is considered a gift conditioned upon marriage between the parties. If the condition does not occur, i.e., if the parties do not marry, then the gift is not completed and ownership of the ring reverts to the individual who gave (and presumably purchased) the ring. Unconditional Gift – An engagement ring is considered a simple gift, which becomes property of the recipient once the gift is completed. However, simply because legal ownership of the engagement ring is easy to determine does not mean that it is easy to recover the ring. For example, if the man is entitled to return of the ring, but the woman has possession of the ring, she might not hand it over simply because the man claims he has a legal right to the ring. If an individual is entitled to legal possession of an engagement ring, but the party in control of the ring refuses to hand it over, the individual entitled to possession of the ring has a right to file an action to recover the ring. The appropriate action varies by state. In Tennessee, an individual would need to file an “Action to Recover Personal Property,” in which the individual bringing suit could clearly lay out its claim for the ring. If the individual bringing the action is indeed entitled to ownership of the ring, the court will enter an order stating as much or award a judgment in an amount equal to the value of the ring. If you would like to read more on ownership of an engagement ring in Tennessee, please read the Legal Guide posted on Avvo. If you would like to read more on different approaches that state courts take in addressing ownership of an engagement ring, please read the Article posted on Primer. As an attorney who practices primarily in criminal defense and family law, I often tell my friends and family that I never want to see them in my office. Point being that, if you are seeking the advice of a criminal defense lawyer or family lawyer, something in your life has most likely gone wrong. That being said, few ever anticipate being charged with a crime in advance of their arrest. In the same thread, few ever plan on getting divorced at the time they are exchanging vows. Everyone has that family friend to call when they are in a bind. If their toilet backs up, they call their cousin’s friend who is a plumber. If their speakers go out, they call up their high school friend who works in electronics. Most likely, anyone reading this article has had a friend or family member hit them up for advice in their specialty. Lawyers are no different. Every day, I get an unsolicited call or email from friends and family with various legal questions. Do I need to incorporate? What can I do if my neighbor’s dog keeps coming in my yard? My fiend owes me a hundred bucks and won’t pay. The list goes on and on. The sad truth to hiring a lawyer is that most people don’t really know where to start. Sure, if you have a family friend practicing law, that is an easy call to make. However, what do you do if you don’t know anyone practicing law where you live? Or if you don’t know anyone in town that practices law? To clear things up, I recently penned a piece for Primer Magazine titled “When and How to Hire a Lawyer.” This piece is a straightforward guide to determine whether you need a lawyer, how to find a lawyer, and how you will end up paying that lawyer. Hopefully this piece can help you or someone you know navigate the complicated road towards legal representation. Welcome to Murfreesboro Law Blog! In this blog, we try and provide helpful information about the legal system. We hope that you find the posts in this blog informative and insightful. If you find a post helpful, feel free to share it via Facebook or any other means. Thanks for stopping by!